This section is from the book "Text-Book On Domestic Art", by Carrie Crane Ingalls. Also available from Amazon: Textbook On Domestic Art: With Illustrations And Drafts. 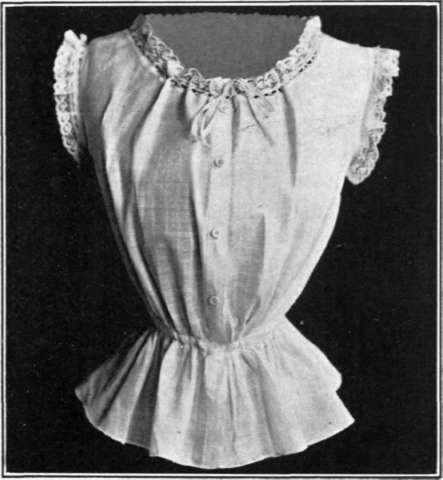 For Corset Cover, Chemise, Nightgown, and Shirtwaist, with the Sleeve for the last two, take this same draft as a basis. Material for corset cover, 1 1/2 yards cloth, 36 inches wide. Long cloth, muslin, dimity, cross bar, etc.